Whelm (Recharge 4–6). Each creature in the elemental's space must make a DC 15 Strength saving throw. On a failure, a target takes 13 (2d8 + 4) bludgeoning damage. If it is Large or smaller, it is also grappled (escape DC 14). Until this grapple ends, the target is restrained and unable to breathe unless it can breathe water. If the saving throw is successful, the target is pushed out of the elemental's space. The elemental can grapple one Large creature or up to two Medium or smaller creatures at one time. At the start of each of the elemental's turns, each target grappled by it takes 13 (2d8 + 4) bludgeoning damage. 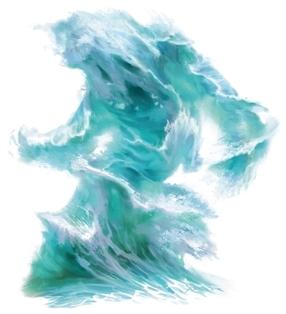 A creature within 5 feet of the elemental can pull a creature or object out of it by taking an action to make a DC 14 Strength and succeeding. Wait. So this water elemental is not immune/resistant to fire damage? Polar opposite i guess. Same with the earth elemental not being immune/resistant to lighting. But you could house rule that. I'm more stuck on the fact that it isn't invisible underwater, like the Water Weird. But again, house ruling can fix that. If you combine lava and water it makes stone or obsidian therfore getting rid of water. If you combine fire and water it makes steam therefore creating an air elemental get it?